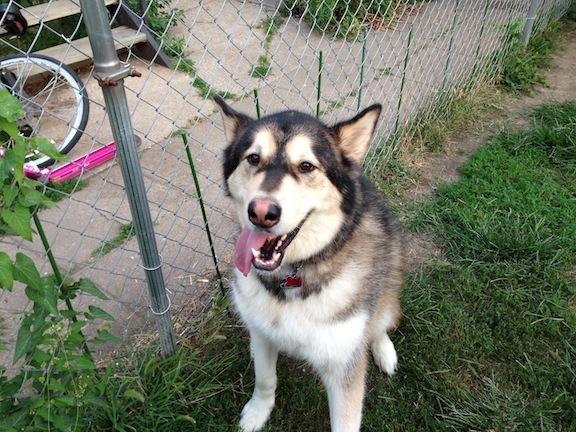 Jackson is a four-year-old male malamute. His owner contacted me after Jackson got into it with a neighbor’s new puppy. Although he was the runt of his litter, Jackson is by far the largest dog that I’ve ever worked with. His owner said she thought he was about 120 pounds, but he looked bigger than that to me. Before I was able to even sit down with his owners to discuss the situation, Jackson jumped up on me three or four times, stuck his nose wherever he felt like sticking it, and showed very little regard for my personal space. Normally I like to sit down and discuss the situation with the dog’s owner before we get into the session, but Jackson’s intrusive behavior required an immediate response. Every time that he got to close to me, I immediately stood up. To dogs, height is a big deal. Whenever you want to communicate to a dog that you disagree with its behavior and it’s not responding, standing up can often get a dog’s attention. In Jackson’s case, standing up resulted in him turning and walking away. At first, it was only a momentary pause as Jackson would circle back around and stick his nose back in my bag or personal space as soon as I sat back down. But after the fifth correction, he started respecting my personal space and stopped jumping up on me. After discussing new rules for Jackson, I demonstrated a leadership exercise to his owners. I placed a tasty meat treat on the floor between my ankles and stood over it. To a dog, this is a guarding or protective position. As soon as the treat hit the floor, Jackson immediately moved towards it. As soon as he did, I took a step towards him to block him from getting the treat. At first Jackson attempted to go around me, however I moved to block him each time. Once he stopped trying to advance, I took a step backward – placing the treat between myself and the dog. As soon as Jackson started to move forward, I did the same so that I was standing over the treat once again. We repeated this back-and-forth a few times before Jackson finally sat down about 4 feet away from the treat. As soon as he sat down, I took a giant step backwards. I waited for a moment and since Jackson did not move towards the treat, I took another step backwards. Jackson stared at the treat and back at me a few times then he laid down. As soon as he did, I took a step towards the treat, turned so that it was on my side, then knelt down and tapped near it. Jackson very cautiously approached the treat with his head down and ears back, pausing to make sure that I was truly giving him permission to have it, then slowly he leaned over and took the treat. I repeated the exercise a few times to make sure that Jackson fully got it, then I coached all the members of his family through the exercise as well. By repeating this exercise daily and gradually increase the amount of time that we ask Jackson to wait before giving him permission to take the treat, he will learn to see and respect his humans as his pack leaders as well as learn how to restrain himself. Once a dog has respect for his pack leader, making the pack leader happy becomes the number one priority. When you combine that foundation with clear communication that the dog understands, most dogs will quickly adapt their owner’s wishes. While Jackson protested when I corrected him at the beginning of the leadership exercise, I didn’t sense any aggression from him. However, since I was called in following Jackson’s attack of the neighbor’s puppy, we headed outside so that I could see Jackson and how he behaves when other dogs are nearby. As luck would have it, the neighbor who owned the puppy that Jackson had bitten was kind enough to bring his dog out into their fenced in yard to assist us. My preferred rehabilitation method for dog aggression is to introduce the dog to a situation that it would normally react to, but in a controlled way. Before the neighbor brought the dog outside, I had moved Jackson to the far side of his yard so that there was a maximum amount of distance between him and the puppy. As soon as Jackson saw the other dog, he immediately tensed up. I could see his ears perk up, his body stiffen, the corner of his lips moved, his head lowered and it was clear that 100% of his attention was focused on this puppy in the next yard. I showed Jackson’s owners how to correct him when he started to show any signs of hostility or aggression. It is much easier to correct a dog before it gets fully worked up. By correcting the dog, and disagreeing with his behavior as soon as it starts, it’s much easier on the dog and the handler. Once Jackson settled a bit, I took a few steps towards the neighbor’s yard. The closer we got, the more amped up Jackson got. I was able to get him all the way up to the edge of his yard while maintaining control, but it was very difficult. I suggested that his owners practice exposing Jackson to the yard while the puppy was in his yard, but from the maximum distance. By repeating this exercise and waiting for him to settle down before allowing him to get any closer to the other dog, Jackson will learn to settle down when in the same situation at that distance. Once that takes place, his owners can then gradually reduce the amount of space between Jackson and the other dog. It will take time and patience, but if the corrections are delivered on time and the leadership exercise I demonstrated earlier is mastered, there is no reason that Jackson can’t learn to tolerate, remain calm and then eventually enjoy the company of other dogs.